When your roof develops a leak it’s usually because a weather event triggered something that went wrong on the roof. As rain pours down on the roof if there is a problem with the roof that rain ends up inside your home causing damage and making for a problem in your home. Storms have high winds, rain, sleet, hail, and a host of other problems that are enemies of the roof. Protecting the roofing on your home from storm damage means you need to take some precautions. Here are some tips to help protect your home’s roofing in Howell Michigan from storm damage. A roof inspection can be one of the best things you can do in order to protect your home from potential problems from a variety of problems including storm damage in Howell Michigan. During a roof inspection a qualified roofing expert will come to your home and look at the roof that is on the home. The roofer will look at all the components of the roof noting any problems that may be present. They will also look for potential problems which can stop a roof leak before it starts. Getting a roof inspection done annually is the best way to keep your roof in good condition and help fight against storm damage on the roof. Plus, with a roof inspection you’ll know details about how your roof is performing and an estimate of just how much longer it may be before you need to replace the roof. There are many different types of roofing that you can install on your home’s roof. From metal roofing to the more popular asphalt shingle roofing, the type of roofing has an impact on how well your roof holds up against weather. Not only the type however, but there are different styles and qualities for roofing as well. One of the best roofing materials that holds up against weather is impact resistant shingles. Impact resistant shingles are one of the only roofing materials available that can withstand hail damage on the roof. 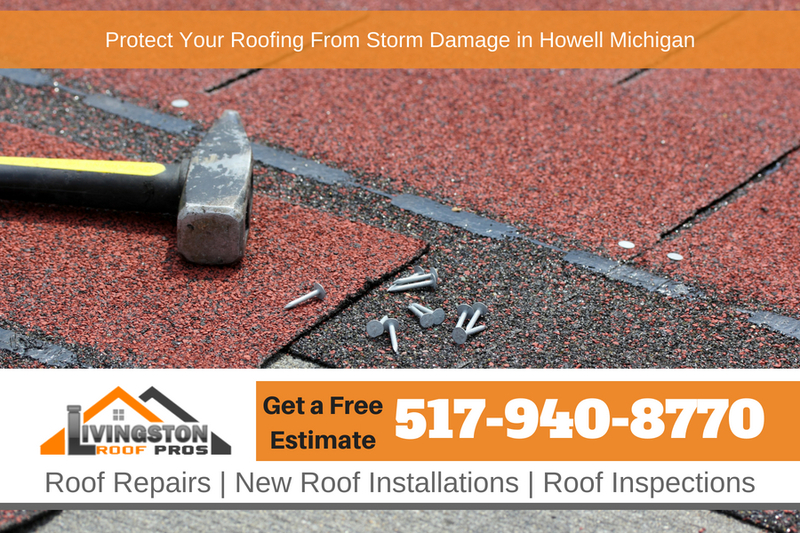 Going with a lower quality roofing can open your home up to being more susceptible to storm damage in Howell Michigan. Another problem that many people never think about is the gutters on their homes. They put off cleaning the gutters until one day there is a problem. When a heavy downpour happens if the gutters are clogged it may not let water evacuate the roof properly which may make the water back up underneath the roofing materials which can damage the roof decking and potentially get inside the home. The same is true during winter when an ice dam forms on the edge of your roof. Making sure water and ice don’t get stopped at the edge of the roof is crucial to keeping your home is great shape and free from storm damage in Howell Michigan. Wind blows trees around and the branches can break causing all sorts of roofing problems. Broken branches falling on your home’s roof can cause damage and you should make sure any tree that is around the home is trimmed away from the roof. You’ll also want to make sure the leaves don’t collect on the roof as well as this can hold moisture against the roof causing a discoloration and premature aging of the roofing materials. If you suspect you have storm damage in Howell Michigan on your home’s roof be sure to call Livingston Roof Pros for a roofing inspection. We are a fully licensed and qualified roofing contractor in Howell Michigan and we offer roof repairs, roof replacement, and roof inspections. Call today for more information.